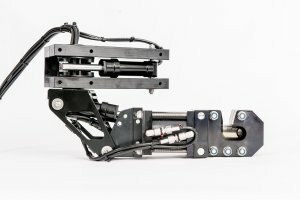 The HLK-33100 Mini Cutter is a compact hydraulic ram cutter, which has been designed to compliment the Mini Gauntlet system. It is capable of cutting 19mm diameter polypropylene rope, or 10mm diameter STAINLESS STEEL wire rope. This compact cutter is a double acting device capable of cutting steel wire rope up to 1 Inch (25mm) diameter and steel bar up to 1/2 Inch diameter. The shaped closure for the cable allowes it to cut the full diameter in one pass. 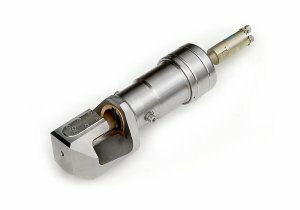 The unit comes with an intensifier allowing operation from a 140 Bar supply. Weight in water is approximately 8.2kg in water.Various mounting options available. 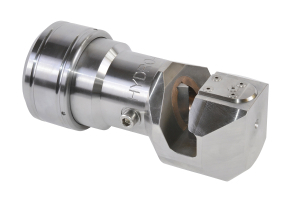 The HLK-33900 standard cutter is a double acting device capable of cutting steel wire rope up to 1.5 Inch (38mm) diameter and steel bar up to 1 Inch diameter. The cutter has a shaped closure for the cable such that it will cut full diameter in one pass. The unit comes with an intensifier allowing operation from a 140 Bar supply. Weight in water is approximately 14.3kg. Various mounting options available.